I’ve been hand lettering for years now, and I’ve learned a ton of neat techniques to create awesome effects. But that stuff can all be a bit daunting to a beginner, and that can lead some to give up early. But it’s not all that hard to get the basic idea of lettering nailed down. 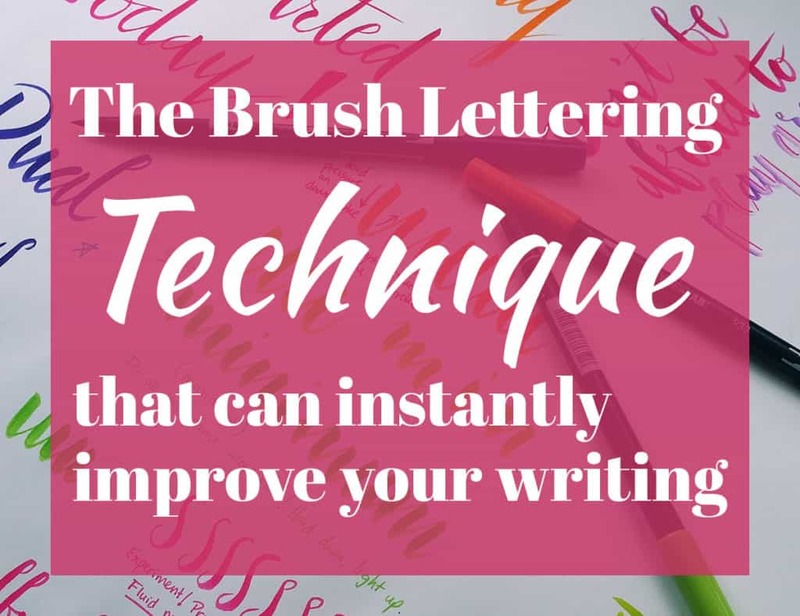 I’m going to let you in on a few brush lettering technique that will improve your lettering by leaps and bounds. Are you ready for this? Before I get into the techniques, I need to talk turkey about the pens. You can’t do brush lettering with any old pen – it must be a brush lettering pen (although you can create a faux lettering look with whatever you have on hand). There are a bunch of brush pens out on the market, but I started where lots of people start – the Tombow Dual Brush Pens. I like these because they are reasonably priced and come in enough colors to keep me busy for a while. These pens are also cool because you can blend them without damaging the lighter colors. That means that I can use a darker color with my yellow pen, and guess what? The pen will still be yellow when I’m done! 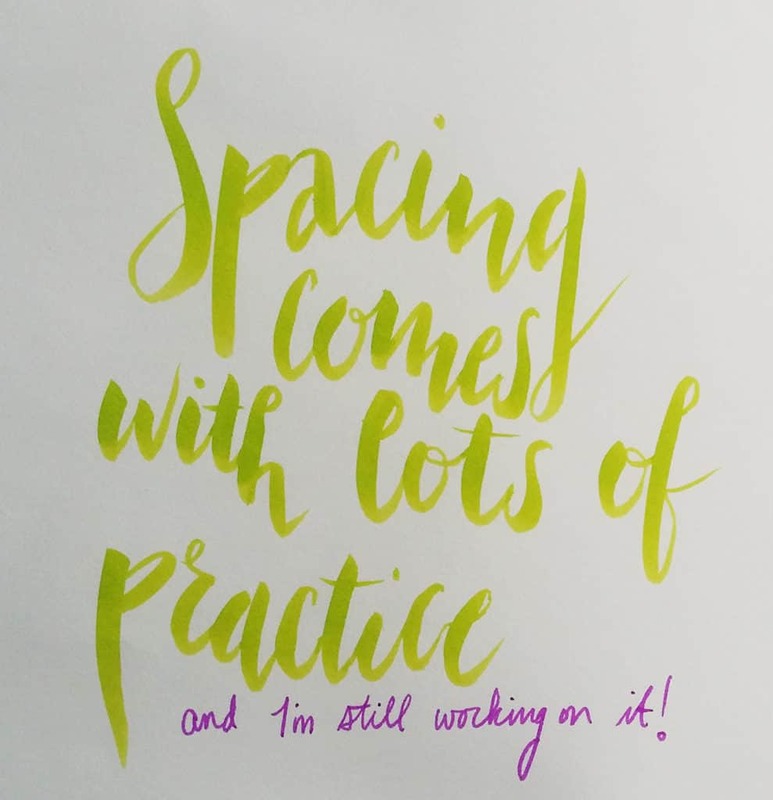 I don’t know what kind of voodoo is at work here, but I love using the ombre brush lettering technique, so you won’t hear me complain! I also love the fact that they don’t bleed through the paper of my Leuchtturm. There’s a little bit of ghosting, but it’s really quite subtle. That’s a huge plus for me. The Tombows are a great first set, but there are tons of other options. Each pen has its own feel, personality, and abilities, so explore and try new brands! You might be surprised which pen becomes your favorite. Here is a post to help you acquaint yourself with all the varieties. So you have your brush pen and your nice paper (cardstock is great for this, or sketchbook paper). You are ready to go! So what is the number one rule of brush lettering? All you gotta do is apply heavy pressure on the down stroke of your pen and light pressure on the upstroke. That’s it! With regular pens, we tend to write with a uniform pressure. If you are picking up a brush pen for the first time, you might use equal pressure throughout and then get frustrated when it doesn’t look quite right. You just need to vary your pressure is all! And remember what I said about using this technique with no brush pen? The trick is exactly the same, you just need to go back and thicken the downward lines instead of doing it all in one stroke. So yes, you can achieve this cool look with no brush pens – although if you’re really interested, they’re not that expensive, so don’t sweat it. 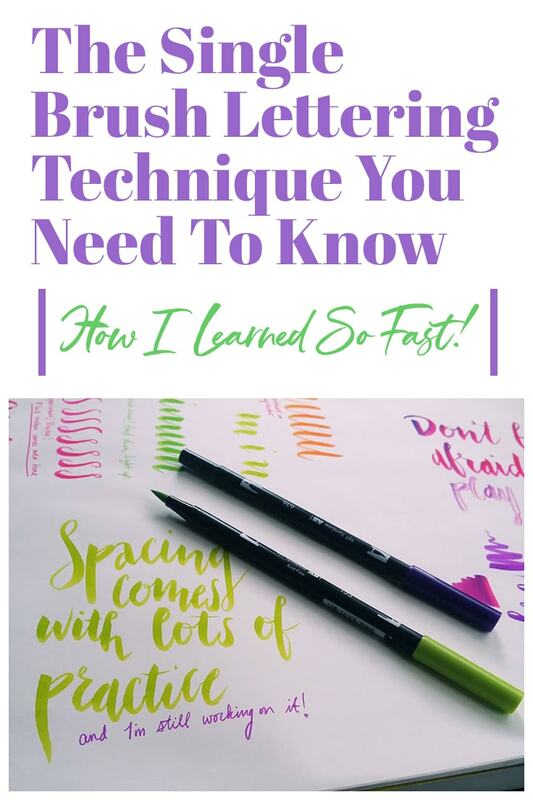 Of course, there are many more brush lettering techniques you must learn before you are a master. But if you adopt this one principle, your lettering will look exceptionally better almost instantly. The key to making it look great all the time is developing a consistent rhythm. This means practice, folks! Don’t worry, it’s really fun practice. Besides the line variation, you’ll also notice that the color lightens and darkens naturally according to the pressure of my pen. Isn’t that neat? Of course, I have more for you! You didn’t think I would leave it at that, did you? There’s the ombre effect I was telling you about. It will feel like you’re ruining the pen the first time you do this, but don’t worry! Also, you should note that I can only vouch for blending Tombow pens. I have no idea how other brush pens blend, so read the instructions before trying anything crazy. 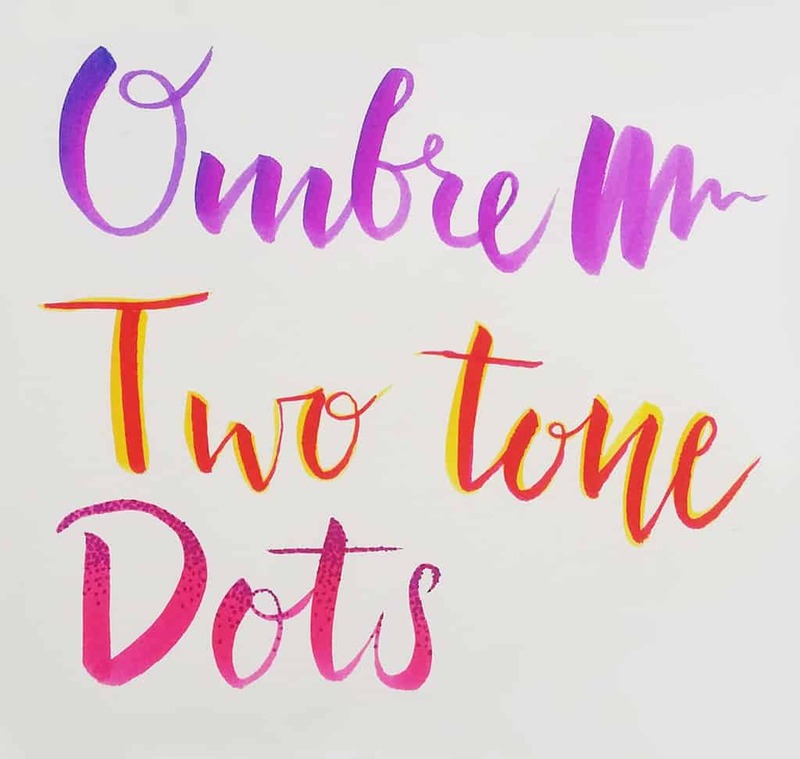 I discovered the two-tone method while playing around over this last weekend and I love it! I’m sure I’m not the first one to think it up, but whatever. It’s fun! Just use a light color as the base, then a darker color and slightly thinner lines on top. Ta da! A cool two-tone look! As for the dots, I got the idea from Kiley in Kentucky and have been shamelessly using them ever since. Now one thing you need to pay attention to while you are working is getting the spacing right. I still struggle with it from time to time. It’s tough! I will often make my words run into each other or space them hilariously far apart. Again, keep practicing and you’ll fix these issues over time. If you want to check out my little collection of fonts, head on over to my Pinterest board and see if anything there tickles you! One great way to practice is to try to mimic the style of a font, so find something that makes you say wow and get crackin’! Above all, remember that this is all fun! Mess around, try new things, and get crazy! Maybe you could practice by writing a letter and having the recipient’s name be in bold brush lettering. Or decorate your workspace with some inspirational quotes. Or write those quotes in your bullet journal while you are planning. 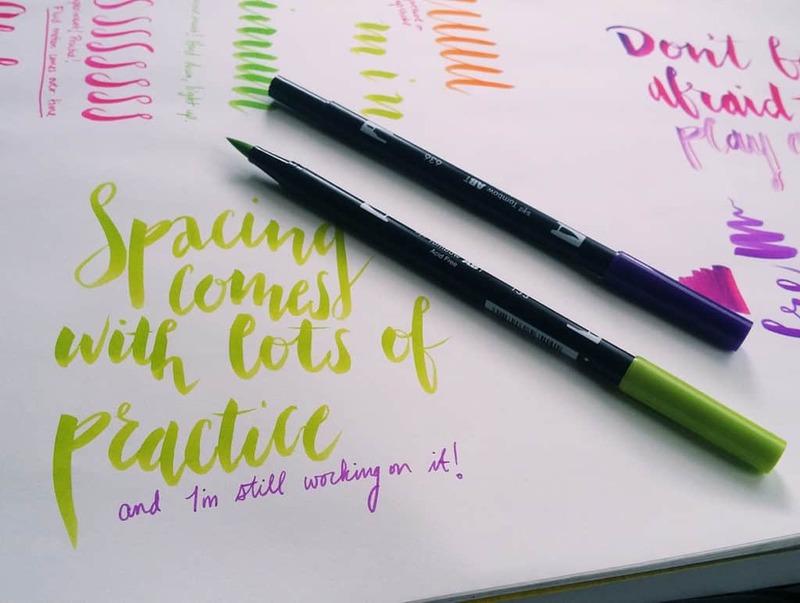 Don’t worry too much about your progress, because with the one simple brush lettering technique, you’ll be whipping out gorgeous art in no time flat. So get out there and make something beautiful just for you! This post is great for getting your feet wet. But if you want to jump headfirst into lettering, then my Brush Lettering 101 course was made just for you! This course was created to help complete beginners and newbies dive into the world of lettering with all the correct materials, techniques, and practice methods for exponential growth. 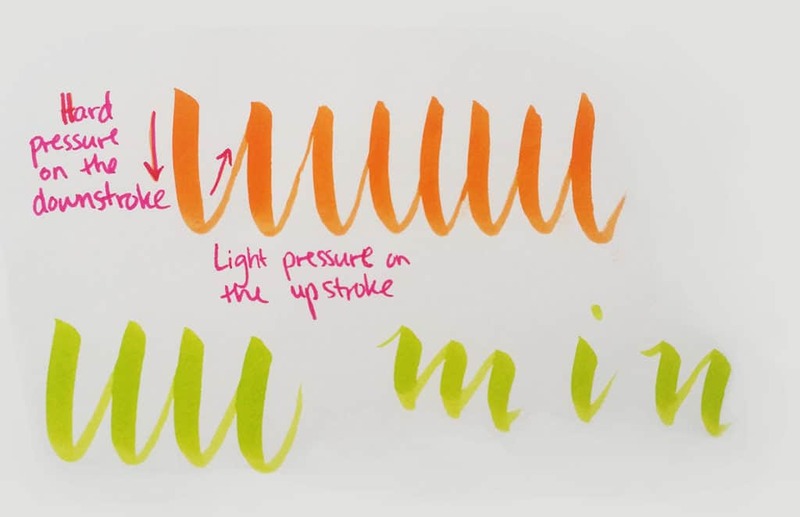 If you’re ready to take your lettering to the next level, then check out Brush Lettering 101! Thank you! I’m a lefty and I still have a lot of trouble holding my pen to get the correct up and down strokes. Any tips? Honestly I still have problem for writing some letter such as “S”, “F”, and “Z”. I download some worksheets but it still feels awkward for me and pretty hard to find my own “style” so that I can write better. But thanks for some tips abt two-tone method, I always thought to go with darker pen first. Keep at it Fai! You will get it down with continued practice. Oh my I love it!!! I love nice writing I hope to learn it!! Thank you Priscilla! You can absolutely learn how to do it too. I was given some brush pens for Christmas. They are a brand I’ve never heard of. I’m wondering if they are not very good pens because no matter how hard or light I push, the line is the same width. The pens do have a fine tip on the other end, so I used the fine tip to create the lighter lines. That looked disconnected. Should I be able to create both thick and thin lines using the brush tip? That’s strange to hear, Leigh! I’ve never had a brush pen that refused to flex. What brand are they, if you don’t mind me asking? A brush pen ought to be able to give you both thick and thin lines. I’m trying to learn how to do this lettering. I have the Tombow brushes and well, let’s just say I have a long way to go! I’d like to learn more about spacing and ‘bouncing’ my letters. do you have a tutorial or worksheet (or formula!) for these? Everyone starts somewhere! And don’t worry, progress comes pretty quickly. I don’t have a super in-depth technique tutorial, but my Beginner Brush Lettering post might be able to help! Keep at the practice and you will get better in no time flat! My handwriting is horrible, but I watch all those videos of people effortlessly writing and creating works of art and I’m jealous. I just bought my first set of Tombows and I’m determined to improve. Thanks again for all your advice. It can be hard to start when you see all the people who are so advanced. But you have just the right attitude to get into it! You might also be interested in my post about how to improve your day-to-day handwriting. I’m sure you’ll be cranking out some fantastic lettering in no time! It happens a lot faster than you realize! love the lettering!! Tottally helps my handwriting! Love it!! Thanks so much!! 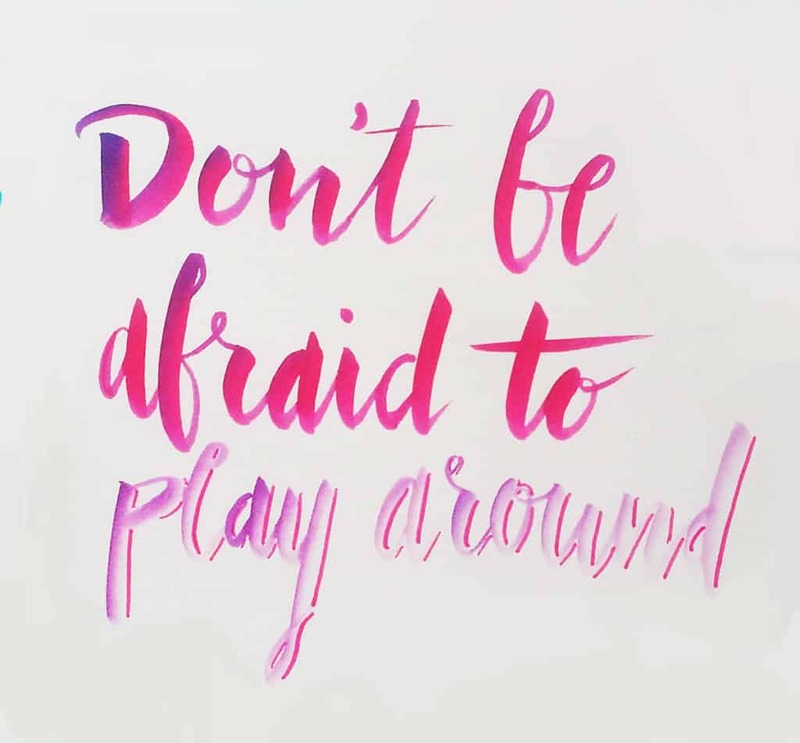 I bet you would have a ton of fun playing with lettering! And excellent blog, I’ll definitely need to pop in again sometime!